As part of fire suppression efforts in public land in Victoria, approximately 2,000 km of new fire control lines were constructed, primarily by bulldozing, during the bushfires of 2003. These control lines represented extensive but narrow areas of soil disturbance, creating a high risk of soil erosion, potential for the establishment and spread of exotic plants, and disruption of native habitat. Following the fires, more than 90% of fire control lines were rehabilitated, with techniques ranging from basic drainage to extensive revegetation. 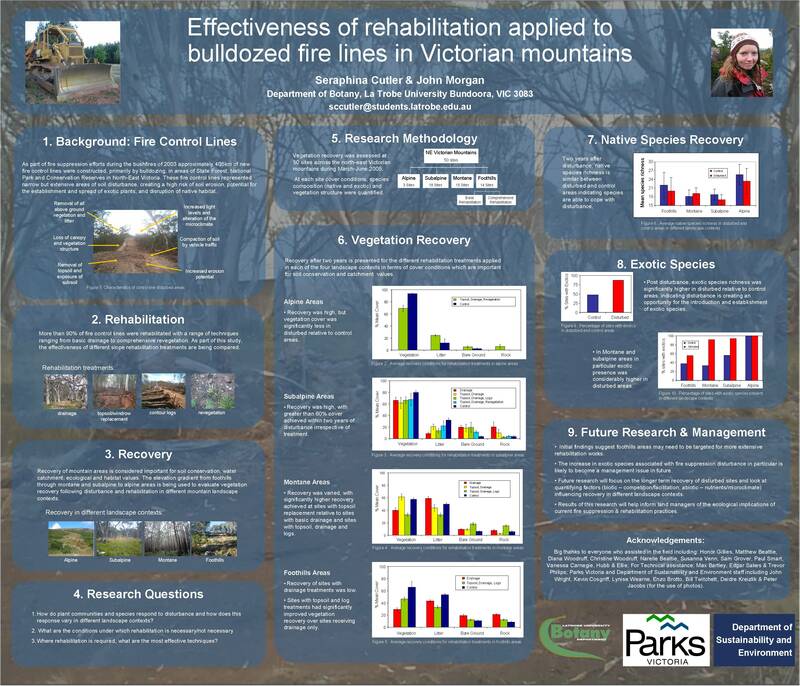 In this study, the vegetation recovery of slope rehabilitation treatments applied to bulldozed fire control lines were compared in four different landscape contexts: foothills forests, montane forests, subalpine woodlands and alpine areas. Treatments included drainage works, topsoil/windrow replacement, contour logs, and revegetation works comprising seeding, mulching and planting. Treatment assessments were conducted at 50 sites during March-June 2005. Bulldozed sites had a significantly higher exotic species richness and exotic species cover relative to (unbulldozed) control sites. Average vegetation cover of disturbed sites varied substantially between the different landscape settings irrespective of treatment type, ranging from less than 40% in foothills forests to greater than 65% in subalpine woodland sites. Treatment effects varied both between and within the different landscape settings. To date, there have been few quantitative studies on the impacts of bulldozed fire lines and the effectiveness of the different techniques used to rehabilitate them. Results of this research will help to inform land managers of the implications of current rehabilitation practices and contribute to the development of guidelines for future rehabilitation works.